Photographing the Aurora Borealis in Iceland was a dream come-true. 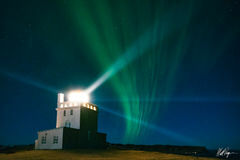 On this amazing night, I found this incredible lighthouse on the southern coast of Iceland called Dyrhólaey Lighthouse. After an adventurous ride up the sketchy road in our mini-van, we were so happy to discover how much character this lighthouse had - surely an ancient beacon to those lost at sea. This nightscape features beams of light from the lighthouse contrasted with the long streaking aurora for a magical scene I will never forget.